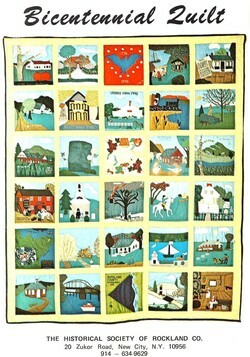 The idea to commemorate the Bicentennial by creating a quilt reflecting the history of Rockland County was originally the brainchild of Mrs. Mary Kennedy of Pearl River. With the sponsorship of the Historical Society of Rockland County and a grant from the American the Beautiful Fund, she was able to assemble an imaginative and hardworking group of women and men. So many people reponded to her call for volunteers that the decision was made to create two quilts. One would be worked by a "day" group, and the other by a "night" group. The first meeting of the groups was held on February 21, 1975. One year later, after many ideas, decisions, discussions, and hours of hard labor labor, the quilts were completed. The Pearl River Library, New City Library, Marine Midland Bank, Ladentown Methodist Church, Ethan Allen Gallery, New City Town Hall, and Masonic Temple in Sparkill provided space in their buildings for th qiters. Hutton-Johnson donated the lumber for the quilting frame, which was built by the Industrial Arts class of Pearl River High School. In preparation for the first exhibition of the Bicentennial Quilts in 1976, each quilter, together with HIstorical Society staff, prepared a short description of the history of his or her square. Some of those descriptions, written 40 years ago, have been superseded by more recent research, but the original cards are maintained in the HSRC Collection as historical artifacts in their own right. Volunteers have made--and continue to make--a significant impact on the success of the Historical Society of Rockland County. The "Day" and "Night" Bicentennial Quilts are now on display at the HSRC History Center, 20 Zukor Road, New City, as part of the "Rockland Voices" exhibition.They not only illustrate the strength of grassroots volunteerism but also teach lessons about Rockland County history. For more information about the "Rockland Voices" exhibition, including hours of operation, click here.